The Desire 616 has a large screen for a mid-ranger but with 720p resolution it won’t be fighting flagships any time soon. This fits the style of smartphone popular in East Asia – screen size takes precedence over resolution, dual-SIM is a must and the more cores the better. We won’t complain about the screen resolution, at nearly 300ppi it’s sharp enough. It’s not an IPS unit though and there’s noticeable contrast degradation and color shift, but the brightness is the real issue – we set it at 100% and wished the slider went further. As for what’s on the screen, Android 4.2 Jelly Bean draped in Sense UI feels outdated for a 2014 smartphone. Sense has traditionally good looks rescue the situation somewhat, however the older HTC Desire 816 (by several months but still) got 4.4 KitKat and Sense UI. It has more RAM too, here the 8 CPU cores and 4 GPU cores have to share just 1GB of RAM between them. It will be interesting to see how the HTC Desire 616 performs in our tests – is there are legitimate reason for an octa-core processor or is it just to help marketing? RAM isn’t the only place where the Desire 616 is below the norm for a mid-ranger – it has just 4GB of built-in storage (expandable via microSD cards) and a small (relative to the size of the phone) 2,000mAh battery. The 13MP / 5MP camera duo we saw on the Desire 816 was also demoted to a 8MP / 2MP pair. The 616 features an unusual dual-SIM setup – it accepts one miniSIM and one microSIM, either can be used for calls, texting or data (note: just one at a time for data). The phone has tools to bind certain contacts to a specific SIM (if, say, they’re on the same carrier) and set up call forwarding. Still, the Desire 816 has a dual-SIM version too and it has goodies like front-facing stereo speakers, besides the others mentioned. The Desire 700 dual sim is comparable in terms of specs and price, but it’s behind on a few specs. 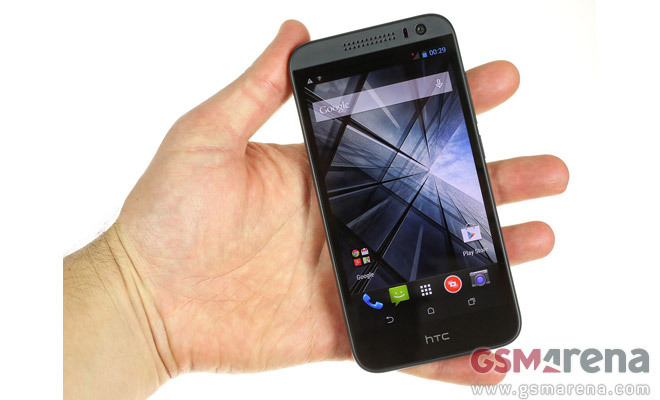 So how does the Desire 616 dual sim fit into HTC’s lineup? That’s the question we’ll try to answer in our upcoming review.